Remove your makeup gently with liquid remover. All skin types can benefit from makeup remover with oil, even oily and blemish-prone skin. Oil dissolves oil! Step one: Apply one or two pumps of the Kathleen Refreshing & Lightening Cleansing Lotion to the dry skin, massage deeply with fingertips in a circular motion, ensure your are going against the “gravity”. Clean your face for thirty seconds to a minute to lift dirt, oil, makeup and impurities, cleaning deep into the pores. Step two: Rinse gauze muslin face cloth in hand-hot water and wiring out before gently exfoliate and remove cleanser. Use a clean section of the cloth for each part of the face, rinsing the cloth thoroughly during cleansing. If you prefer, splash cold water on your face at the final stage to tighten your pores. Kathleen cleanser is a pH balance one and sulphate free, contains 6 active botantical ingredients including organic tamanu seed oil, avocado oil, rose water, lavender water and lemon extract. After cleansing, you feel soft and comfort (not tight and dry)! If you want to use a handy beauty device to deep clean your skin, you can choose Kathleen Facial Sonic Cleansing Device. This Sonic Cleansing Device has combined the sonic pulsations with an innovative silicone brush design for a deeper and gentler cleansing. When channeled through smooth, silicon touch-points, the sonic pulsations remove blemish-causing impurities and dirt, leaving the skin clearer and lighter without harsh abrasion. The waterproofing design is perfect for your facial cleansing routine when you bathe or shower. To achieve optimal daily routine results, you need to use our pure cotton gauze muslin face cloth for gently exfoliation, lifting away makeup and dead skin cells to reveal smoother, clearer and lighter-looking skin. This extra gently way of exfoliation prepares your skin for the next step of skin care treatments. Alternatively, you may us chemical or physical exfoliator to scrub gently in a circular motion to remove all the dead skin cells which can give your an unsightly and flaky appearance; but keeps your pores from getting clogged and help your facial skin look fresh and bright. Remember exfoliating too often or too vigorously can irritate your skin. Home exfoliate may not suit all skin types! This light scented and alcohol-free Kathleen Rebalancing & SoothingTonifying Mist is ideal for all skin types, even extra sensitive skin, to revitalize and soothe your skin. This exclusive gentle and botanical formula of aloe vera, glycerin, chamomile and lemon extracts helps to moisturize dry skin and heal and soothe skin irritation, leaving skin more tone, less redness and radiant appearance. The essence affects skin on a cellular level, leading to an increase in elasticity, moisture and firmness. You apply the essence with your fingertips all over your face and neck in a circular motion and move out and up. Our Silk Miracle Essence is a formula protect your facial skin in 7 dimensions – crystal clear, firmness and elasticity, less visible spots, reduced fine lines, anti-oxidants, anti-irritants and promotes the appearance of radiance. I absolutely see why girls love this lightweight product. Different serums concentrate on different skin issues. For example anti-aging or dullness, you can give yourself a facial massage while massaging the serums into your skin. Massage in a circular motion for 10-20 seconds working from the chin and upward to cheek and nose and the forehead. From the age of 30+, you can use our Kathleen Glamour Ageless for classic anti-aging. If your skin is dullness, you must try the Kathleen Amazing White which leaves your facial skin looks more radiant and bright. Serums are a real asset to your skincare routine, keeping your skin firm and glowing. Alternatively, our therapist recommends: wearing Kathleen Amazing White in the morning for brightening during the day and wearing Kathleen Glamour Ageless Serum at night for rejuvenating your skin while you sleep. You tap the eye cream around the eye area. Don’t rubbing or pulling. Eye cream protects and nourishes the skin around the eyes. Massage or pat a pea-sized amount of eye cream under your eyes using your fingertips, sweep around the outside corners of your eyes and end with your fingertips at the inside corners. Repeat the motion for 4-5 times. 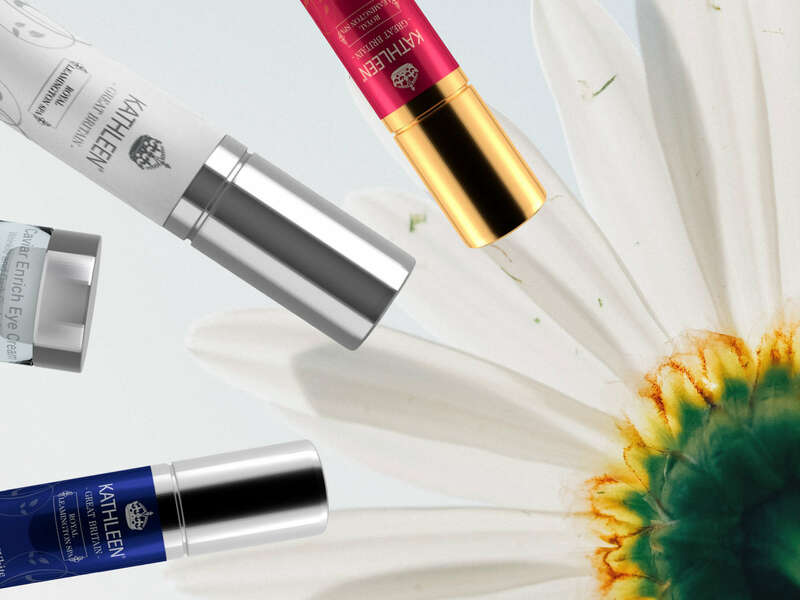 You will feel wonderful after using our Caviar Enrich Eye Cream. If your skin doesn’t need some parts of the routine, skip them. Sometimes less is more. Always be gentle to your skin, don’t rub or pull. Use a cotton and soft facial towel and clean it every time. Unlock the Secret of Coenzyme Q10, Sweets accelerate skin aging, and Roughness, Irritation, Fine lines, Tightness, Flaking.